The following fact sheet was assembled by the team at Vanamatic Company to spell out their concerns to their Senator. This is as articulate a case as we have seen. Too bad they don’t get it in Washington D.C..
Manufacturing is the country’s productivity powerhouse: a strong and vibrant manufacturing sector is a critical component in our country’s long-term economic future. 1987 thru 2005, manufacturing productivity grew by 94%, roughly 2 1/2 times faster than the 38% increase in productivity in the rest of the business sector. 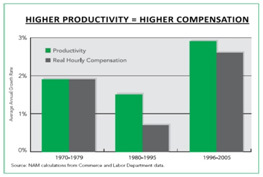 With productivity comes higher wages. Manufacturing jobs pay 23% more than the rest of the workforce. Every $1.00 of manufacturing sales supports $1.37 in other sectors. Educational, healthcare, and social services support $.70. Every manufacturing job supports as many as 4 other jobs. We've been reducing CO2 as a matter of good business. 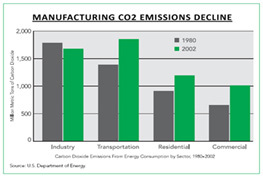 Manufacturing CO2 emissions have dropped by 6% compared to a 38% increase in other sectors. Reducing energy needed to produce as well. 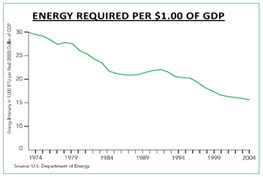 Energy requirements per $1.00 of GDP have dropped by almost 50% in the last 30 years. Half of the reduction is attributed to increases in energy efficiencies of industrial manufacturing. Who will pick up the jobs if manufacturing continues to decline? 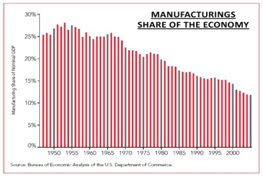 Manufacturing has declined from 25% in the 1950s to 12% of the GDP in 2005. The U.S. has lost over 5 million manufacturing jobs since 2000. Individual net worth has declined by 25% since 1999. 2/3rds of private sector R&D in the United States is done by manufacturer. More than 1 in 6 U.S. private sector jobs depends on the manufacturing base. What do you think about the Administration ‘s and Congress’ current treatment of Manufacturers? This entry was posted on Tuesday, December 15th, 2009 at 5:29 am and is filed under Break Room, Engineering, Front Office, Shop Floor. You can follow any responses to this entry through the RSS 2.0 feed. You can leave a response, or trackback from your own site. I can agree with most of what is said here, however I would like to point out that many large public companies don’t get it either. Many have starved domestic operations for capital while investing heavily overseas in an attempt to grow profits endlessly. This has resulted in the decline of manufacturing jobs here and I beleive ultimately lead to the demise of GM and Chrysler (I beleive there is more to come). American corporate arrogance and irresponsible government regulation and lax oversight have combined into a powerful force working against we the people! Productivity has always lead to job loss look what it has done to agriculture. However the more productive you are the more competitive your buisness is. I wonder when the day will come when we can all kick back and collect benifits as robots do our work.